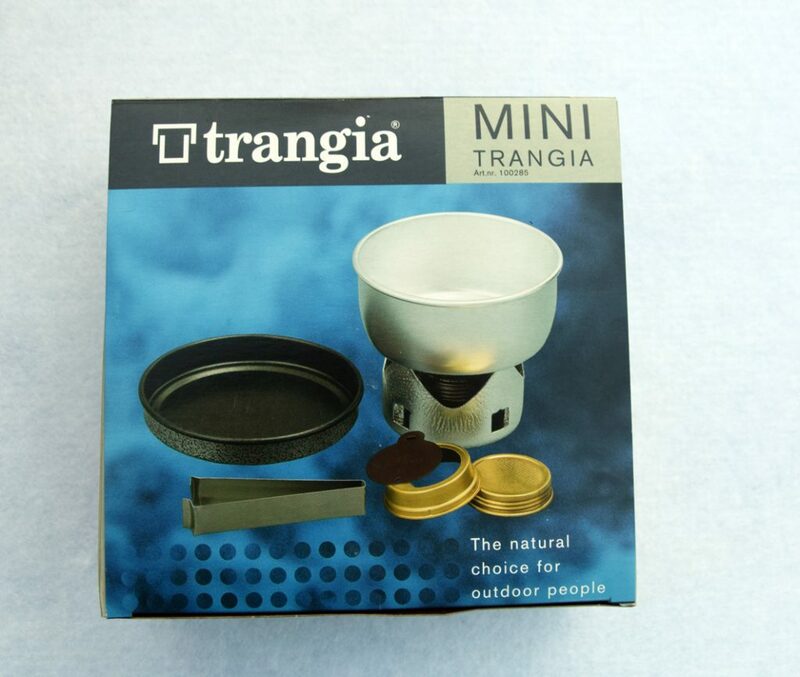 The Trangia Mini Stove set is Trangias smallest offering. 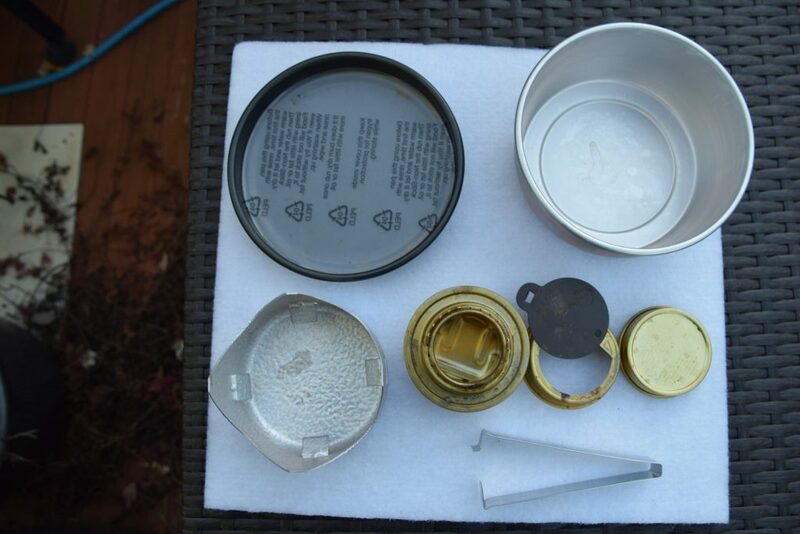 These stoves use methylated spirits (Heet in the USA) in a small fuel burner built in into a combined stand/windshield that allows the pot to sit on top. Up until recently Trangia stoves would have been the most widely sold stove on the Australian market and while they still have a huge following they are rapidly being replaced by many hikers with either gas stoves, or integrated gas stoves. 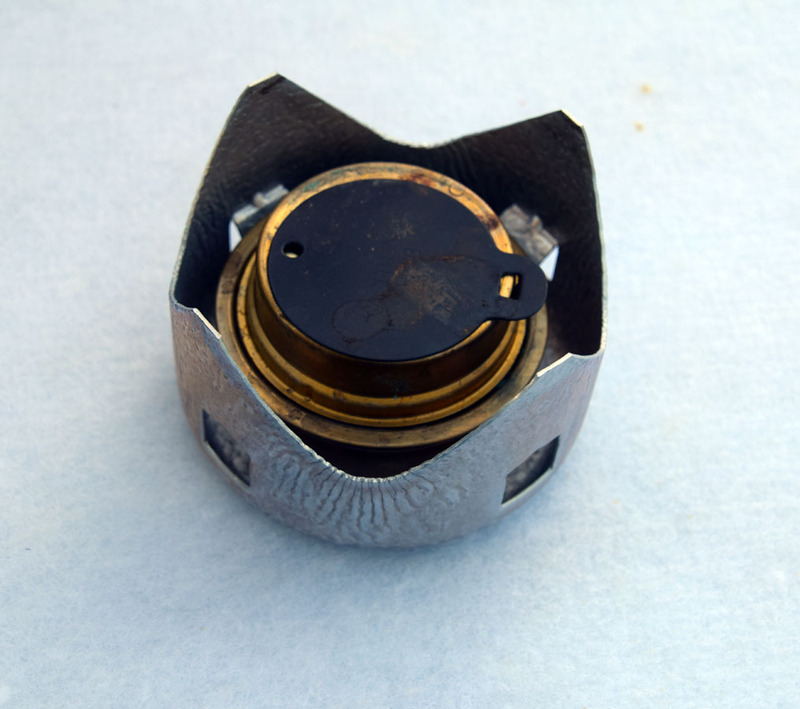 In a recent survey we conducted 26% of hikers identified they use this stove type (spirit burners)as their main stove for their hiking adventures compared to 60% using either the gas stove or integrated stoves. The kit comes with an 800ml pot as well as a fry pan that doubles for a pot lid. As this stove set is metal don’t be tempted to handle hot pots by hand but instead use the pot grip that coms with the kit. I would advise some practice sessions with full pots as there is a bit of skill required to manage this process. The pot grip that comes with the larger Trangia 27-1 set is much more robust and easier to use. This stove can be used for cooking as well as boiling water for rehydration and they manage to do this well however their main drawback is speed taking just under seven(7) minutes to boil 500ml of water. We don’t cook on the trail as we find that it adds to much weight to the pack and its just plain fiddly, instead I prefer to eat cold, or to just rehydrate. We tend to have two hot drinks/day along with a dehydrated meal and every second night we will have a dessert. In total this requires 1.5-1.8 litres of boiled water (for two [people). While the cooking process is slow the grand total for our fuel usage is approximately 14 cents for the approximately 40 ml of methlyated spirits that I need so this would be hands, down the cheapest stove type to run. In addition the slow speed is what makes then suitable for cooking but does mean you will use more fuel. But hey at this fuel price it not going to break the bank. For simple overnight trips these are not the lightest options, as you will need to carry a robust container with your fuel. You can always use lightweight containers but make sure that they are secure as methylated sprits can severely damage much of your equipment if the bottle leaks. Trangia produces a dedicated fuel bottle which while not lightweight at 115 grams empty they are the most secure way to transport fuel. A 500ml bottle of methylated spirits will last the two of us for 10 days but this will depend on your cooking style. If you do full on cooking when you camp your fuel requirements could be double or triple what I have discussed. While there is nothing stoping you from using the Trangia Mini to cook with the size and lack of saucepans limits there use. 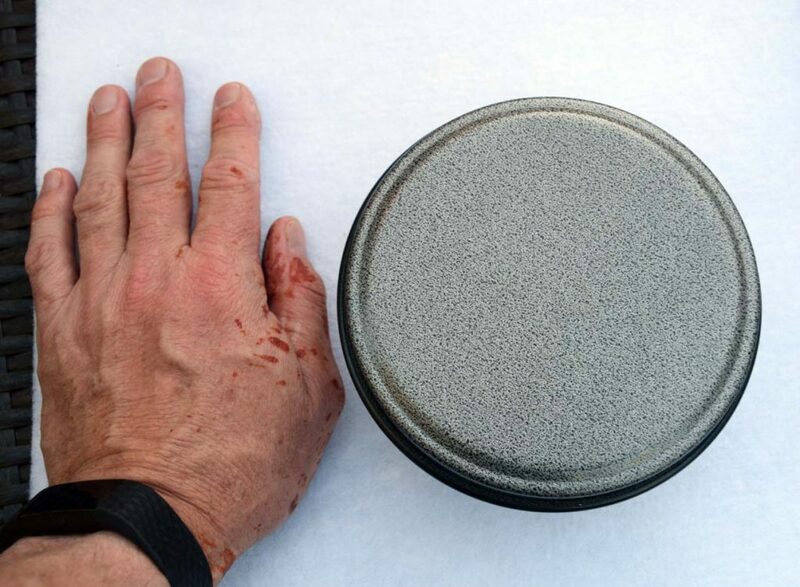 There is no one perfect stove and in addition to the speed of cooking the Trangia Mini has some other disadvantages. One which you will eventually learn to eliminate is that you need to accurately estimate the amount of fuel that you need to add to the burner. If you don’t add enough and the burner runs out mid cooking then you need to wait until it has cooled off otherwise you run the risk of injuring yourself adding fuel to a hot container. I managed as an 11-year-old to set my hand on fire cooking with methylated spirits which thankfully caused no permanent damage. In addition this stove, like its bigger brother the Trangia 27-1 are prone to wind and even with the integrated windshield/burner holder this will only do so much so try to set up the stove in a protected area. Ensure that the surrounding ground is cleared of any flammable material such as leaves or pine needles as I have also seen the fuel spilled at camp sites causing fire on the surrounding ground. This is not something you want to do in times of high fire danger when the types of fires can quickly get out of control . As such, this is a stove for ‘adult’s only’ or older kids under strict supervision. In many Australian parks and reserves if there is a total fire ban you cannot use a naked flame so these stoves then become a ‘no go’. Some of the wilderness areas that I camp in also prohibit open flames at any time so you need to be aware of your local regulation. If in doubt check with the local rangers. While Trangia stoves are lightweight for their stove type but there is not much you can do about the bulk. The Trangia Mini is the most compact in the range and for us we need to do about two boils to do an evening meal. 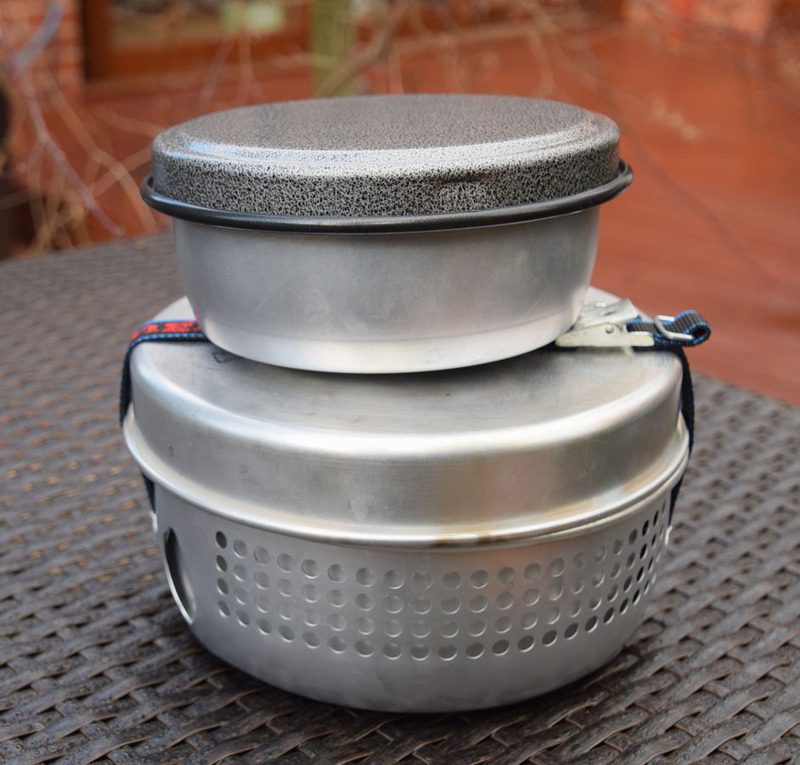 I also own the larger Trangia 27-1 UL which is great for larger groups or for those that want to cook ‘proper’ meals on the trail but as I refine my hiking style in an attempt to become an ultralight light hiker I find that this unit is rarely used any more. So why would you use the Trangia mini? 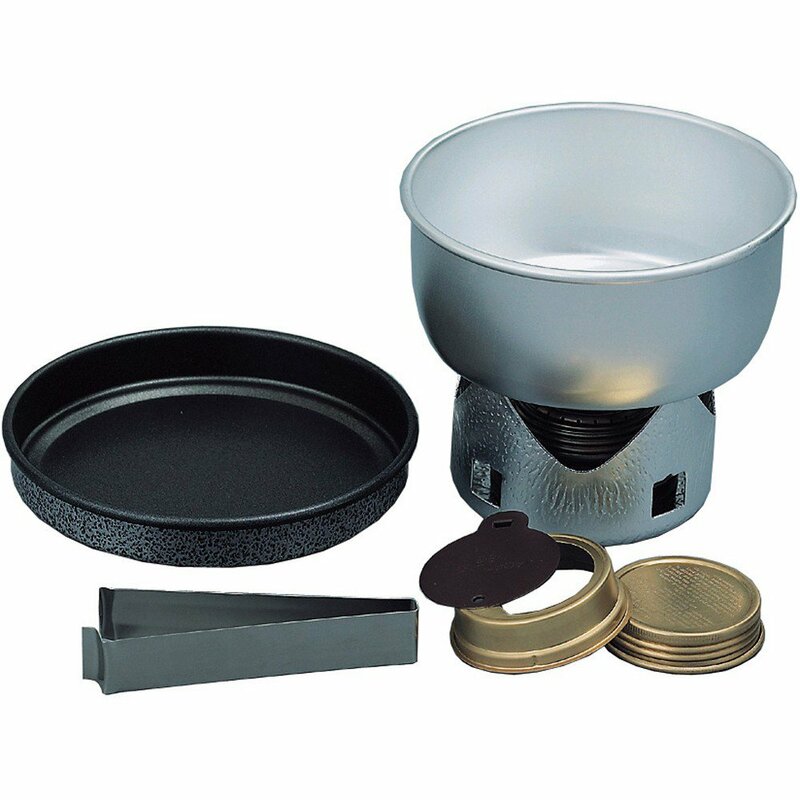 This is a great little kit for couples or solo hikers who aren’t fussed about the speed of cooking, want something that is cheap to run, and is mainly used for boiling water or very simple cooking. It is also easy to use providing you follow a few simple safety rules in regard to fuel handling. 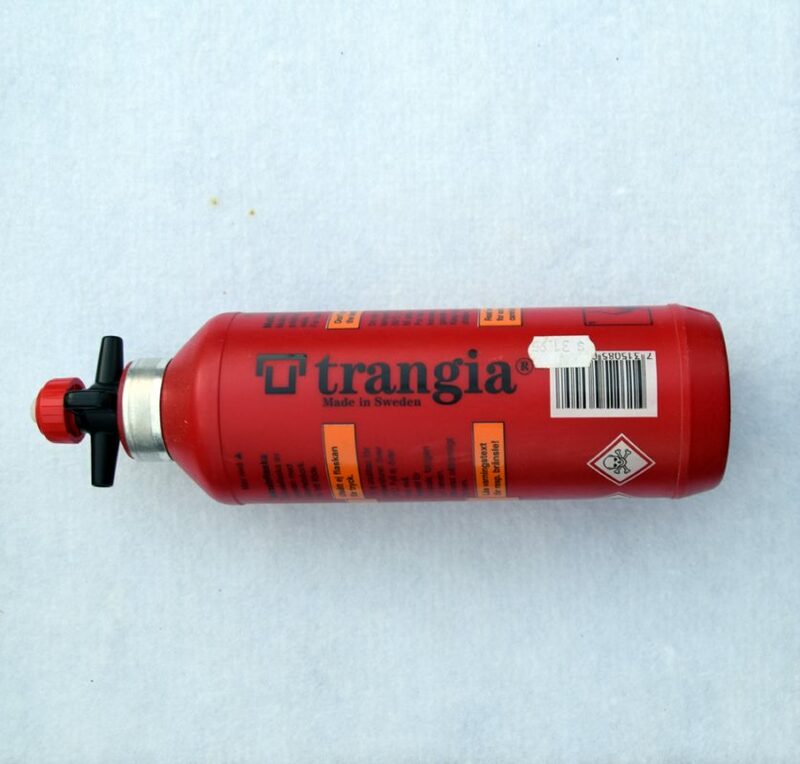 Trangia 500ml fuel bottle. This bottle is heavy at 115 grams but I would strongly advise that you use either this commercial product or something similar as leakage of methylated sprits into you backpack can be very expensive as it will easily damage most other equipment.